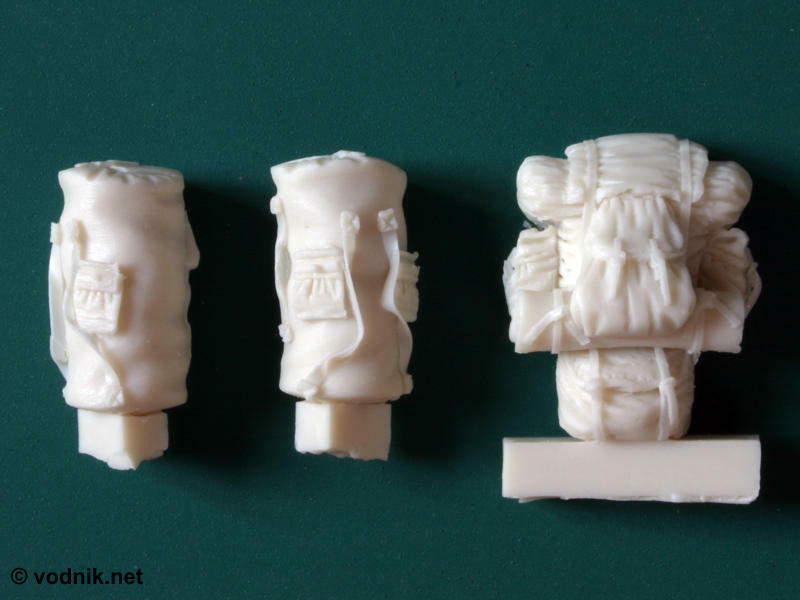 Czech company Goffy Model offer a very interesting range of 1/72 and 1/35 scale resin accessories for modern and WW2 armor. Reviewed here is a small set of Modern US troop equipment. The set comes packed in a neat cardboard box with a photo of painted contents of the box on an inkjet printed label. 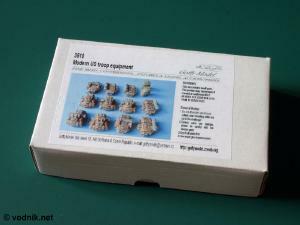 Inside a box is a single resealable zip-bag with all resin parts inside. No protective filler (foam or bubble wrap) was added, what could cause a problem in case of fragile parts, but no such are included in this set. Judging from the box photo we should get eleven MOLLE packs and two duffel bags inside the box. The same contents of the set is also shown on photos in Goffy CD catalogue, which I received with product samples. Unfortunately in the first review sample set I received, there were only ten backpacks and no duffel bags included. Goffy quickly sent another set and this time it contained missing duffel bags, but there were still only 10 backpacks inside - I guess that this is what we were supposed to get, and eleven packs shown on the box are a mistake. Contents of the first set I received. Note partially removed pouring blocks. Click on picture to enlarge it. Two duffel bags were missing from the first set I received from Goffy, but they sent another copy, which included them. Close-up shots of three (out of five) variations of MOLLE packs in the set. In the set we get five variations of MOLLE pack, each of them having slightly different layout of pouches, bags, canteens and sleeping mats. Such diversity can be extremely useful when you attach several packs to one vehicle and don't what them all to look like clones. 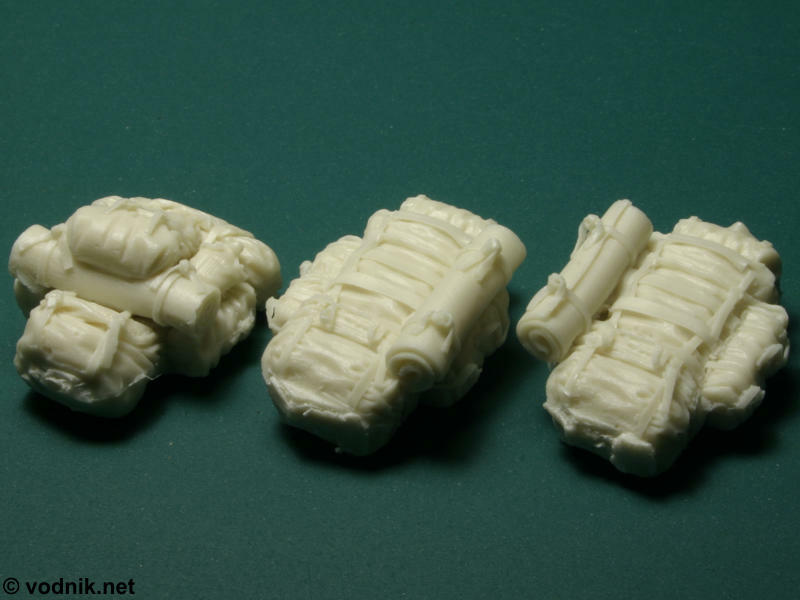 And as fully configured MOLLE packs are quite large, both in reality and in 1/35 scale, not many of them is needed to make a vehicle look busy. Put four of them on a Humvee and poor little truck will almost disappear behind them :-) So with ten packs which should normally be included in the set, you can easily equip a couple of models! 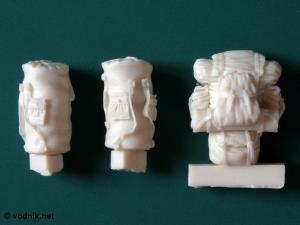 Details on resin MOLLE packs are truly amazing with all the straps and buckles perfectly rendered. I compared the packs in Goffy set to pictures of some real components of MOLLE system and it looks that resin products is very accurate and perfectly captures the modular features of the prototype. 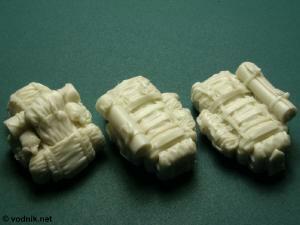 Some air bubbles can be found on parts if you really look them, but they are small, sparse and hardly visible (at least on unpainted parts) thanks to the number of straps and folds which cover the surface of packs. Resin pouring blocks were partially removed from packs in my set, but still some cleanup would be necessary. I tried to attack the resin with a sharp knife and it cooperated fully, so there should be no problem with removing pouring blocks even if you find them still on parts in your set (as they are present on similar parts included in Goffy Model set for AAVP7 vehicle). Often when I get review samples, I notice good quality of product but at the same time I know that I personally won't use it as it doesn't fit to any of my projects. This time it was very different! As soon as I opened the box with Goffy set, I immediately knew that this is the product I was really looking for! I already have enough ALICE packs to fill the cargo bed of 1/35 scale HEMTT truck, yet MOLLE packs are still hard to find. But if you look at pictures from Operation Iraqi Freedom, you will easily notice that ALICE packs are quickly disappearing, particularly from US Marines units and are being replaced with MOLLE gear. Particularly USMC Amtracs were often seen heavily loaded with those packs. Goffy Model set perfectly hits the area of the market where not many products were available yet. And they do it with style! 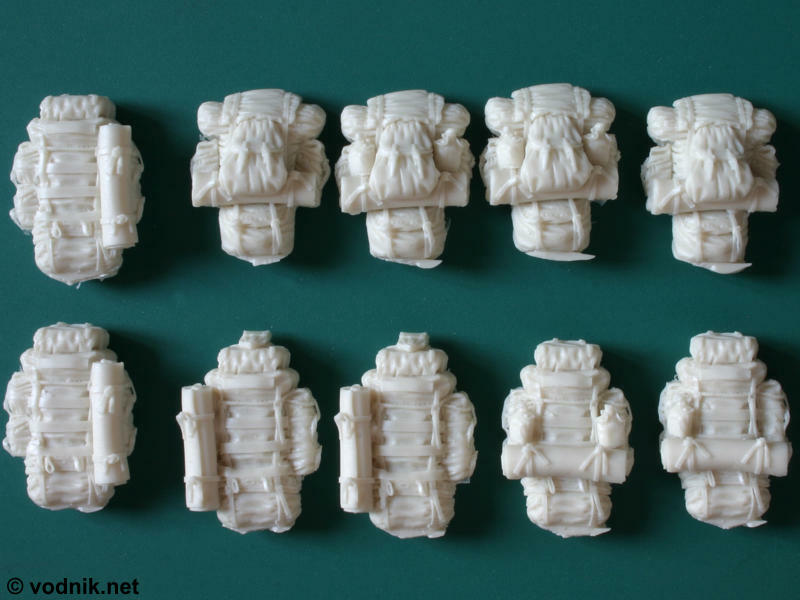 Not only we get MOLLE packs, but they are also perfectly sculpted and molded. Of course parts missing from the first review sample reveal some quality control issues on Goffy side, but they corrected their error sending other, complete set quickly, so at least their customer service seems to be good.